I turned 60 in April. As the season of rebirth was beginning, I entered this new decade with a spirit of change and growth taking root in me. I was determined to make it a productive and prosperous time. I embarked on a plan to shed, finally, the pounds that had been weighing me down both physically and mentally. Additional exercise was not a real option given my torn rotator cuff and the impending surgery to repair it. So I instead carved carbohydrates out of my diet and began a plan that emphasized protein and vegetables…lots and lots of vegetables…and lentils, nuts and beans. Pounds started melting off my body, my energy level was up, my sleep improved and my digestive system was on much more solid ground. By August 1, the day before my rotator cuff surgery, I had dropped several pounds. The number was not important to me because I was feeling so much better than I had before the “no-carb” diet. The surgery was more extensive than the surgeon had thought it would be and my recovery time was extended, as was the start of physical therapy. Still, I was not discouraged. I was regaining my independence within a week from the surgery; I was even painting. My friends and family were by my side to help me on every level and complimented me on my swift recovery and excellent attitude. Four hours later, curled into the fetal position on my bed, almost breathless from the intense abdominal pain, I knew it was not some seasonal ailment. The EMTs who answered my 911 call, family and friends who came running to my aid, agreed that it really was something. Mercifully, a shot of morphine left me caring very little what it was, as long as “it” could be diagnosed and fixed. By midnight, we had the answer: diverticulitis, causing an abscess on my colon and two other pockets of infection. The cautious route was chosen and I was put on IV anti-biotics for the next ten days. I lived on ice chips. Glucose, saline and antibiotics ran through a spaghetti of tubes into my upper right arm. My left arm was immobilized. I drifted in and out of a pain-killer induced haze, sometimes coherent and chatty, sometimes withdrawn and without recognition of the visitors who came often to my room. My daughter did not leave my side, my brother visited every night. I could feel myself getting worse, fading away, suddenly afraid. The decision to operate was welcomed by me, after those debilitating ten days. Surgery removed the abscess and one pocket of infection; the other was slowly being removed by a drain in my belly. A crooked line of twenty-eight staples marched from my pubic bone up to and through my navel. And, a tube was down my nose into my abdomen to drain fluids from my gut. Eight more days of ice chips and diarrhea the likes of which neither my nurses nor I had ever seen. In the midst of my recovery, my son arrived. After four days with me, he witnessed the removal of the tube from my nose, remarking afterward “Where did you get cheekbones, Mom?” Friends tolerated glimpses of my tush as I moved frequently from bed to bathroom, making only kind remarks about my lank hair, pale skin and sagging flesh. Finally, 21 days after I was hospitalized ,I was released to a rehabilitation center, Daughters of Sarah. There, I was greeted with a private room, my own bathroom, air-conditioning and matzo ball soup. The food and therapy, sleep and care, brought me to the point where I could walk, wash and dress. After 14 days, the staples and the drain were removed. Six days later, they let me come home. More surgery is likely to take place after the first of the year to remove the four to ten centimeters of colon that instigated the attack. I will not be sorry to see it go, though I dread another surgery. October was a surprise to me as I was driven home. When I entered the hospital, the hazy heat of late August was upon us. 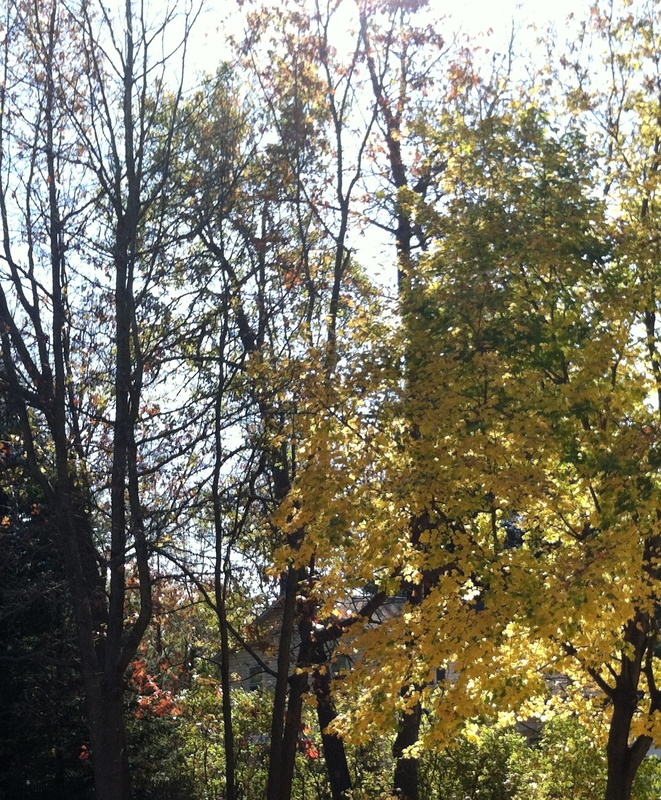 When I came home, a chill was in the air and the leaves were almost past peak, their colors were yellow and russet. No bright reds, no deep greens hanging on till frost shocked them into gold. The time of my release was appropriate. As I drove by myself for the first time on October 16, on the back roads I was struck by colors of the season. The landscape was a palette of muted tones: beiges and browns, ombre, ochre and gray. The trees were more bare than leafy. The fallen leaves lay in slightly sodden piles. The fields were barren of produce; almost colorless corn stalks swayed in loose columns as the brisk breeze blew through and around them. I could almost hear the sap of the trees drawing in and down, to hide inside, to wait. Nature was turning in upon itself, husbanding its resources for the coming dead of winter. Last Spring, with the advent of rebirth, I decided to reinvent myself. But with Autumn’s preparation for the coming onslaught of cold and dark, I, too, feel the need to conserve and protect. My focus now is on myself. Each day is a challenge of building my strength while conserving my energy, eating enough to rebuild muscle but not gain weight, performing my daily tasks and trying each day to do a little more, but not taking on too much. I am autumnal too. I am beige and grey now. I will be hibernating, waiting for next Spring, to sow the seeds of new projects and plans. I am husbanding my resources, preparing for surgery, rehabilitation and more and more physical therapy. I know that I will survive and succeed, with my family and friends. But now is the time to gather strength and hold it inside. I will weather the winter, safe in my surroundings, and await the Spring.